Hybrid PCs aim to provide all the advantages of a handheld tablet with a fully functional laptop. Discover their potential, including an appraisal of the new Microsoft Surface devices, in my Micro Mart issue 1232 six page feature article - out today. Laptops are essentially a portable desktop machine, complete with powerful processor, large storage capacity, enhanced connectivity, well-specified operating systems and fully-featured application software. Their owners need a device that supports a wide variety of construction-focussed activities. A device that can create and edit office documents, write blogs and articles, fabricate and process images, produce and manipulate videos, design and build websites, or develop and test software apps. However, a tablet is quite a different proposition. It's a consumption-centric device, aimed primarily at leisure and entertainment activities. Tablet owners want to swipe through photos, kick back with a video, catch up on missed TV programmes, listen to music, play games, surf the web and read ebooks. The smaller 7 inch screen versions are ideal when reclining on the couch, visiting a coffee shop, travelling by train and packing the holiday suitcase. Tablets with high definition 9 to 11 inch screens are more suited to business professionals and researchers, who wish to read documents, magazines and websites without recourse to frequent zooming in and out. A successful hybrid device must cater for both construction and consumption activities. It's quite a challenge. Any device attempting to run office suites, software development tools or high-end image and video manipulation applications must have a reasonable screen size, adequate CPU and graphics horsepower, plus a good quality keyboard. Yet, lightness, portability, touch-centric operation and long battery life are the prerequisites for tablets you can pop into your bag as you head out of the door. Take the Surface device case for example. It's thin and light, constructed from a unique VapourMg material. VapourMg combines the strength and lightness of magnesium with an industry-first process that forms a tough, scratch-resistant, subtly tactile finish. It has a superbly designed, integrated flip-out stand with a high-quality, dependable hinge mechanism - all in the same VapourMg material. Despite the sleek form it's still endowed with a good selection of connectivity, including full-sized USB ports. Then there's the snap-on covers, complete with integral keyboard and trackpad. They're attached magnetically in an easy snap-on operation, yet hold securely. They protect the screen and give a reassuring 'book-like' feel when carrying the device around. The crux of the Windows 8 architecture is its dual personality. The classic desktop mode still exists to deliver that familiar productive experience and ability to run the powerful software required for office, web, multimedia and software development activities. However, the desktop is now supplemented by a new Metro-style user interface. This UI offers a radically different, colourful, touch-friendly user experience. Gone are the fiddly menu options, scroll bars and general multiple window clutter. They're replaced by a collection of horizontally sliding tiles supporting swish-able panels, pinch-able zooms and gesture invoked operations. The Metro-style UI is attractive, clean and fast. The 'live tiles' deliver real-time, dynamically-updated content, such as weather reports, RSS feeds, new email messages and tweets. It successfully creates the sort of laid-back, consumption-mode experience that's best enjoyed while reclining in a comfy chair, lolling around on the sofa, or sipping your cappuccino. 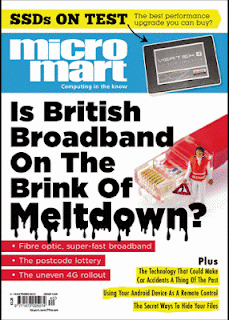 Purchase Micro Mart back issues in a variety of formats at the Zinio website for just £1.49 each. Dividing a world into mysterious zones is an inspired storytelling concept. The conditions in each zone dictate the type of technology that can be employed, and anyone crossing a zone boundary will suffer from physical distress. It all leads to considerable intrigue and tension as the main characters, Quillon and Meroka, undertake their long journey. The zonal constraints impart a distinctly steampunk feel, with horses, airships and various steam power contraptions making regular appearances. Each zone tends to have its own collection of inhabitants. Although largely humanoid they often exhibit divergent evolutionary traits, including enigmatic Angels and dark-souled Skullboys. The grotesquely memorable Carnivorgs are an exception. I found the book both entertaining and easy to read, but it might not appeal to everyone. Some may be unhappy that many certain key aspects are never fully explained. For example the source, number and extent of the zones, or the origins, capabilities and evolutionary map of its humanoid inhabitants. Plot lines are sometimes left hanging in a wait-for-the-sequel type fashion - especially the ending. Yet, as there is no sequel, some readers may feel shortchanged with this approach. Of course, just as in real life, a fictional book doesn't have to provide all the answers. As a writer, hanging story lines simply stir my imagination. 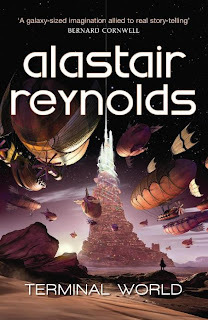 And, in the end, I found this book had a distinctly different feel to other SF books I've read. A good thing in my opinion. Data privacy and control is a big issue in these cloud-centric times. It often seems users are blocked at every turn when trying to access their own information. However, the Data Liberation Front can help. Find out how in Micro Mart issue 1230. The ability to view, download and delete cloud-stored information is often heavily restricted. Try to uncover exactly what details have been captured and stored and you'll invariably be confronted by a wall of silence. Why? Well, the value of personalised data to organisations like Google, Apple, Facebook and Amazon is immense. If a user cannot move their information en masse, they are far less likely to move to a rival service. With so many Google products and services the team faced a considerable challenge. Although Google already had a rich collection of low-level programming interfaces, they didn't always fit the bill. And delivering a well integrated solution, which also incorporates appropriate levels of security, isn't the simplest task in the world. As a result it's taken quite a while for the project to get off the ground. The technology developed by the DLF team may help Google's public image, and go some way to pacify those who say their 'Don't Do Evil' motto has been forgotten in a headlong rush to complete with the likes of Apple and Facebook. The annual Department of Transport road accident statistics are tragic and depressing. These accidents wreck lives, destroy families, create financial havoc and stress the NHS system. Soon all new vehicles will be fitted with Advanced Driver Assistance Technology, designed to significantly reduce the number of deaths and injuries. 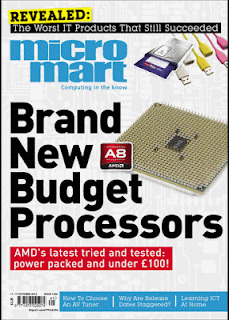 Find out more in Micro Mart issue 1229, out today. Figures released for the UK from the Department for Transport (DoT) make depressing reading. In 2011 almost 2,000 people lost their lives due to road accidents, a figure that includes over 450 pedestrian and 107 cyclists. This exceeds the death toll from four jumbo jet crashes. Widen the scope to European roads and the number of fatalities climbs to tens of thousands. UK injury statistics are much higher still. DoT's 2011 figure for reported car occupant injuries was just under 125,000, with more than 8,000 of those being serious in nature. The road-related injuries suffered by pedestrians and cyclists are just as depressing at over 8,000 a year - that's over 150 every week. Autonomous Emergency Braking (AEB) systems continuously monitor the scene directly in front of a car and use smart software to ascertain if a collision is likely to occur. If there's cause for concern the driver will receive some kind of audio-visual warning of an impending accident. In the event a driver fails to take the necessary action and the situation becomes critical, the AEB system will act independently of the driver, applying the brakes to perform an emergency stop. LIDAR uses light beams to offer a lower cost alternative to radar. These beams illuminate the scene and a receiver captures the light reflected back from any objects. In this way it can ascertain an object's shape, size and distance information. LIDAR isn't restricted to visible light. Ultraviolet, near infrared and laser beams can be used for improved range and low-light imaging. This capability means LIDAR is routinely found in surveying instruments, archeology equipment and onboard aircraft and satellites. Volvo is well known for its safety focus. So, you probably won't be too surprised to know it is one of the leaders in AEB research and implementation. Some models, such as the XC60, S60 and V60 have had AEB options since 2008. However, did you know Audi, Ford, Honda, Jaguar, Lexus, Mercedes and VW all offer AEB-installation options. Two mainstream examples are the highly popular Ford Focus and the Volkswagen Up.